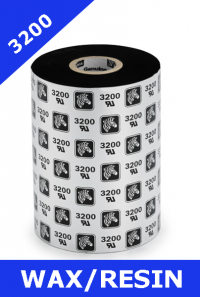 Zebra 3400 and 3200 wax / resin thermal transfer ribbons. Zebra 3400 high performance wax/resin provides excellent print quality on Zebra paper and matt synthetic materials. 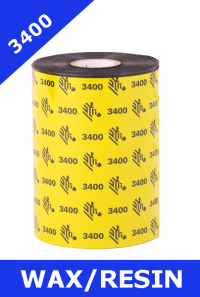 With good resistance to scratches, smears and moderate chemicals, the 3400 ribbon is UL-recognised when used with various Zebra materials. Print speeds of up to 200mm per second can be achieved even with rotated barcodes. Zebra 3200 premium wax/resin provides excellent print quality on a wide range of Zebra paper and synthetic materials. 3200 offers very good resistance to scratches, smears, everyday chemicals and higher temperatures, along with the ability to print at up to 250mm per second. UL and CSA recognised with various Zebra materials. ZM600, Zebra 105SL and 105SL Plus, Zebra Xi4 series. Supplied on 25mm cores, they are either 300m or 450m long.